Victor Von Vulture hates living on Planet Venus! It’s so hot that his food is always ruined, and his chocolate is so melted that he has to drink it with a straw! What’s a vulture to do? Surely on the planet next door – Earth – the food would be way better! 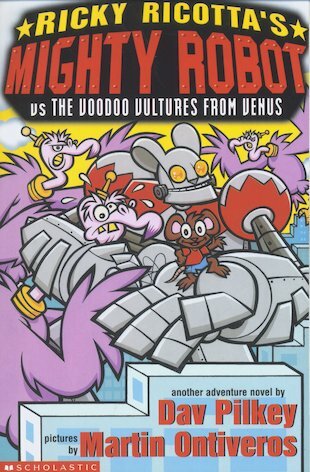 So one terrible night, Victor and his army of vicious vultures invade Planet Earth by broadcasting a voodoo ray through all the televisions in the world! The next day at school, little mouse Ricky Ricotta realises that something is very wrong. Everyone is walking round in a daze and carrying tasty nibbles towards the town centre, where Victor and his Voodoo Vultures are devouring every bite of food in sight! Can Ricky and his Mighty Robot serve those vultures a big surprise, and save Earth’s inhabitants from slavery?